When an item is right clicked and cut or copy are selected, at the time of paste (using right click) the menu doesn't reflect that there is an item available to be pasted. While the paste is still possible, the menu line is grayed out. If another nautilus window is opened then the Paste menu item is correctly enabled and not greyed out. When nautilus is restarted and there is nothing availble to be pasted the menu item is greyed out and not selectable. Thank you for your bug report, I can't confirm that here. Does it happen all the time in any directory? Did you change anything to your nautilus configuration (using list mode for example)? Does it happen in a guest session? I've attached a screen capture video showing how to reproduce. It's not only PASTE in my case. Sometimes: when opening an extra pane in nautilus , COPY to MOVEE TO are grayed, even though I click on a file with the mouse's right button. I am frequently using different themes and still having the issue. Seems to me that gksudo nautilus /somepath triggers the bug. 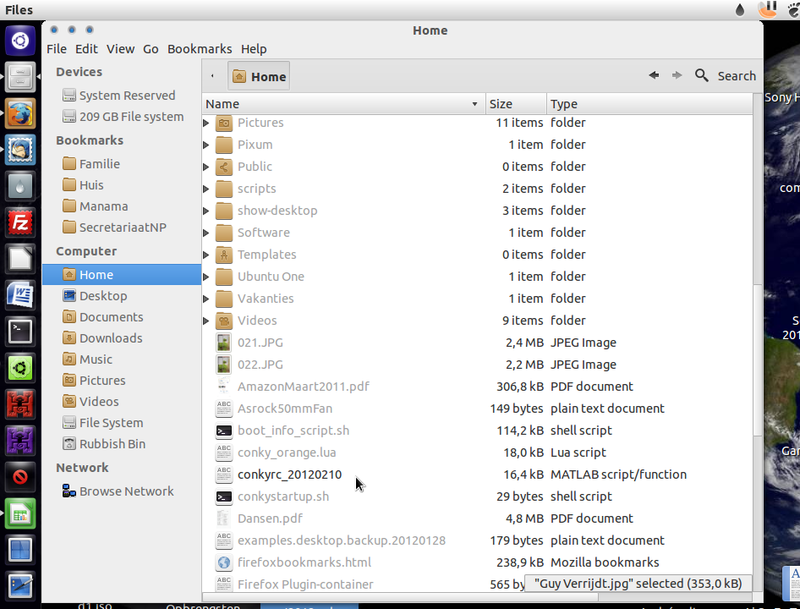 In the screencast you can see that I open a folder using gksudo, copy a file and paste it on desktop. The Paste menu item is grayed but not action-disabled. Same for Resize Icon and Restore Icon's original size. Upstream thinks it's that issue: https://bugzilla.gnome.org/show_bug.cgi?id=672046 and that "the theme information does not get invalidated properly"
or to labels inside menuitems"
so i guess yes, there might be side effects"
"you'll potentially see that problem everywhere where someone changes a menuitem from insensitive back to sensitive and does not recreate the menu, but just hides it"
&nbsp;summary &nbsp;"nautilus popup menu highlighting using some functions incorrect (items displayed inactive when they are not)"
That workaround could potentially add regressions. I'm sorry, but just because of one possible workaround you're marking the whole bug as invalid? I have this same problem with Rename on my Samsung N310 with 12.04 up to date. Stéphane Guillou, this "rename" problem has occurred here, too. 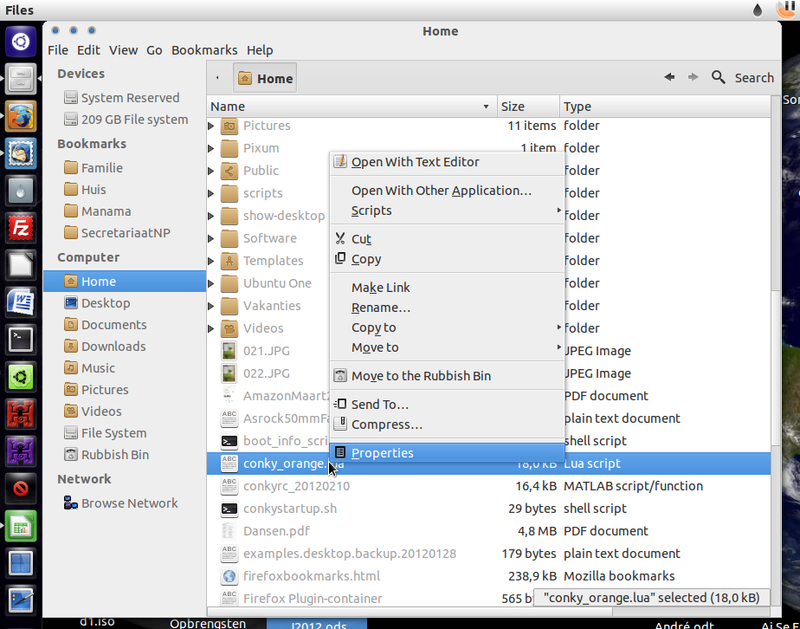 I have the same greyed out controls in Nautilus Menu (copy-paste, rename). 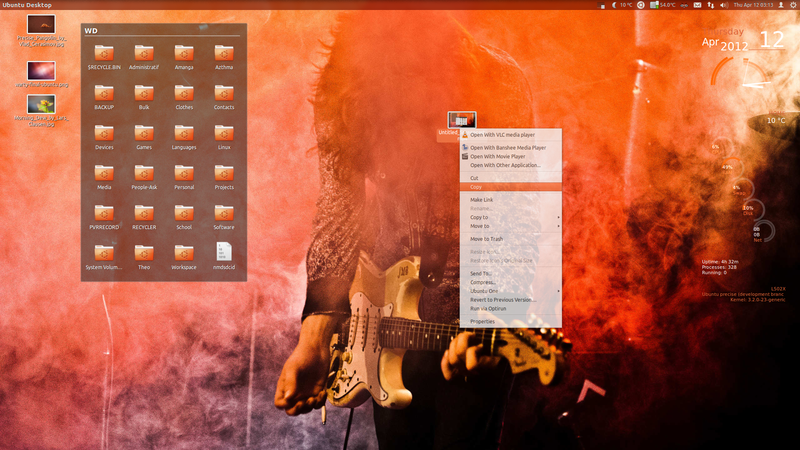 I'm using Ubuntu 12.04 64-bit with Unity, fresh install. Usually closing and re-opening Nautilus (Launcher Home) helps temporarily. On top of that, sometimes the entire list of filenames is grayed-out, although they are clickable and can be opened. Text turns black upon hovering over the arrow. i still have this bug... so i miss the part of "Fix Released". Today i updates the whole system to see this bug fixed.... but still there. Any real way to fix this? doesn't say "gtk+3.0 (Ubuntu)" is 'Fix Released'. I would just add the bug appears also when you create a new directory or for existing directories. I have just install U12.04, it is up to date, and I think a patch should be released by the way of the Update manager especially for a LTS release (Version 12.04 (precise) 64 bits Noyau Linux 3.5.0-29-generic GNOME 3.4.2). Sorry, I mean: The options "rename" and "suppress (=put in the trash)" appears in grey, but works, on directories too. I was with Ubuntu 12.04.2 updated. The problem occurred. The light-themes package was updated. And there isn't bug now! Oops! The problem returned after that I rebooted the machine. I marked this bug as affecting Linux Mint since it followed me from Ubuntu 12.04's Nautilus to Mint 14's Nemo. I haven't tested Mint 15 yet, but I will in the following weeks. As user hanynowsky mentioned above, the Copy and Paste options aren't the only ones grayed out. For me, when right-clicking on a file, the "Open with [associated program]" doesnt' appear at all. In addition, the following menu items are missing: Cut, Copy, Make Links, Rename..., Copy to, Move to, Move to Wastebasket, Delete. Closing all Nemo windows and then opening a new one seems to fix the problem for a while (no "killall nemo" required). How about updating to gtk+ 3.4.4? > How about updating to gtk+ 3.4.4? I use Ubuntu 12.04.2. GTK+ 3.4.4 fixes it? There is a PPA? I don't want GnomeShell, I want the Unity default. The bug still is present in Ubuntu 12.04.4. Is there a chance that it will be corrected one day ?